A frightening video of tsunami waters surging through Banda Aceh was aired on NBC News last night. It's also available on video.msn.com (thanks KB), for Win users (only – Bill strikes again). The images give a whole new meaning to the word debris – "bits and pieces left from destruction"* hardly fits. In the video, you scarcely see the violent waters – it looks more like a grey glacier of garbage rushing down a steep grade, except that the weather is tropical and the street is flat. Once again, the undercurrents of my father's traumatic childhood resurface in my limited little brain. Because his family had drowned, my father was adamant that his kids learn to swim. Trying to quell his anxieties, I worked hard to succeed in the classes he sent us to. At 10 and 11, I rapidly ascended skill levels so that I was swimming with much older kids (competitive military brats, all). With each of my promotions, my father's pride swelled. He even bragged that I would compete on the Olympics swim team some day. Unfortunately, I deeply disappointed him a few years later when I stopped swimming (I'd become conscious of not fitting the prevalent Texan tastes in women's body types and avoided swimsuits throughout my teens). While watching the Banda Aceh video, my father's obsessive push for us to swim suddenly didn't make sense to me. His family didn't drown because they couldn't swim. 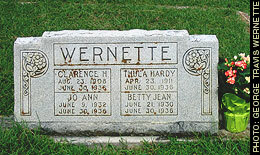 Newspaper accounts quote witnesses telling how his father, Clarence Wernette (usually misspelled in the reportage), heroically rode his horse through the current to rescue neighbors who'd built their homes closer to the river – and how he was hit by a tree limb and slipped unconsciously under the muddy torrent. His wife and two daughters, whom he'd left 'safely' on higher ground, were killed a bit later by a crush of water and the debris of the house he'd built for them. Since December 26th, I've read dozens (hundreds?) of stories and commentaries on private and commercial news websites from around the world. Over and over I've read of people ascribing that day's natural disaster, or surviving it, to either the grace or the vengefulness of gods of various belief systems. In response, I've been devising an entry on why the Book of Job has been my favorite since I'd read the Bible over 25 years ago – how, since the 1980s, I've responded to misguided Christian friends who insisted that disease, especially AIDS, was divine retribution with, "Really? Have you read the Book of Job lately?" But in his NY Times op-ed piece "Where Was God? ", William Safire makes my case far better than I could have. Overall, he nails it. Certainly, as Safire writes, one of the lessons from Job is that "suffering is not evidence of sin." And, although I'd never looked at it this way, I also like Safire's argument that "questioning God's inscrutable ways... need not undermine faith." However, Safire and I may diverge slightly on the lesson to take from God's response to Job's defiant questions. I've always thought the concluding point was not that we creatures, with our limited little brains, can safely question God, but rather that... there is simply no point.